Spending 7 years on a manhole cover hunt across the country, you start to appreciate our intricate, massive, and presumably indestructible infrastructure. Most of our pieces are created from sewer or water covers and many are over 100 years old. We can admire the beauty of their exterior designs but have no clue whats happening below. Like most American’s, I guess I’ve always taken clean (and usually free) water for granted. We expect that what we are drinking is pure and something we should never have to think twice about – almost a right. We’ve been following the Flint tragedy since it broke two years ago and it’s a horrific story. Neurotoxins in lead can lead to brain damage and children were the most vulnerable. 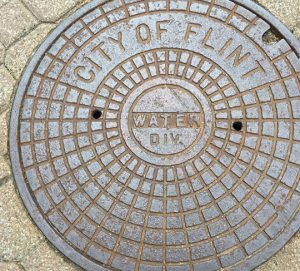 I thought about my nephews, niece, and every other kid I know – and how each child in Flint is just as precious and should receive the same opportunity everyone else does. I wanted to help in some way and found Flintkids.org through a search. It’s a great organization that provides a 20+ year support system for the kids most affected by the lead contamination. The portrait the media painted of Flint was nothing like being there in person. There are real struggles, but it’s a lot like every town – cafes and shops, beautiful architecture, clean parks, and a lot of smiles. I met some amazing people who really care and a city staying strong. We took the 5 hour drive from Chicago this past spring to spend the day making these 3 individual prints, then drove back a few months later to deliver the final pieces. All 3 have been auctioned off with 100% of proceeds going to a great cause. We know the money raised from is small compared to the overall response, but still happy to continue to raise awareness and keep this in the headlines. Not to bash the government or the officials involved, but to make sure this does not happen again and maybe help people appreciate what we normally take for granted. The support and donations from all over the world – from strangers who never stepped foot in Flint – is a beautiful thing in it’s own right. In the midst of everything else going on, it’s refreshing to see people caring about people. You can still support the cause and purchase this art at the Flint Collection. 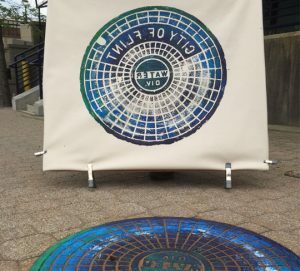 Original Artwork made directly from a utility cover in Flint, MI.